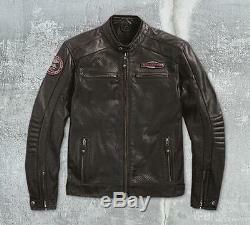 Men's Perforated Leather Cruiser Jacket. Heavyweight abrasion-resistant buffalo leather with perforated panels for airflow. EN1621-1 CE Approved Removable Body Armor at shoulders and elbows. Lightly padded channel quilted elbows. Lightly padded back waist and shoulders. Interior pockets include: Two horizontal and one zippered vertical pocket. Metal badge on lower right pocket. Embroidered and printed applique graphics on back. Meets or exceeds EN 13595 Requirements in abrasion resistance, impact testing, and seam bursting for CE Certified Personal Protective Clothing. Limited Edition / End of line item. 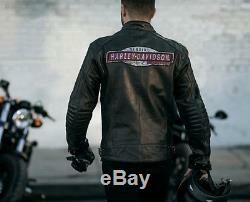 The item "Harley-Davidson Men's Perforated Leather Cruiser Jacket Medium Small Fit 97183-1" is in sale since Wednesday, August 30, 2017. This item is in the category "Vehicle Parts & Accessories\Clothing, Helmets & Protection\Motorcycle Clothing\Jackets". The seller is "chesterhd" and is located in Chester, cheshire. This item can be shipped to United Kingdom.